"Since Liz's mother had been killed in a car crash three years before, Ethel had been trying to muster up enough motherhood to do right by the little girl. Right now she stroked the child's red hair and rubbed her fingers gently across her forehead. She had just gotten word that she had a tremendous gig singing her brand of bebop jazz if she could just be in New York City in two weeks…..But what about Liz? Liz was her dead sister's only child. Surely she couldn't move Liz to New York, where the scarlet nights blazed much hotter than they ever did in Philadelphia, and the mornings were hungover with the deepest shades of blue. The child needed soft pink things, stability." years after college, she worked in a series of government positions, spending several years at the Philadelphia City Council, and then at the Forest Service. 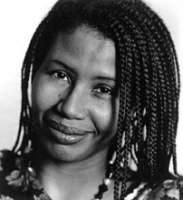 She then began writing creatively and went on to publish three novels: Tumbling (Simon & Shuster, 1996), Tempest Rising (William Morrow & Co., 1998), and Blues Dancing: A Novel (William Morrow & Co., 1999). In addition, she regularly contributes nonfiction pieces to Philadelphia Magazine, Essence, and had a short fiction piece in Philadelphia Inquirer Sunday. One reader commented that her writing: "…makes me marvel. It is smooth, sure-footed, wise as old folks, hip-hop street smart, a beam of laser light that illuminates the human condition." Another reviewer said: "…from the first pages the book, Tempest Rising locates us on an intricate map of relationships, trying to find in which direction lies home…" Another exclaimed: "If you haven't read this book [Tempest Rising], run out and buy it right now! Ms. McKinney-Whetstone, keep doing what you're doing!!!! Hey Oprah-how about making this a selection for your Book Club?" Ms. McKinney-Whetstone has twins, a son and daughter who are now 18 and in their first year of college. I was approaching a significant birthday, and doing the life examination one does as the age of forty comes around. At the time, my professional writing involved public affairs and public relations, as well as 'translating' scientific reports into lay terms audiences could understand. I realized this wasn't the type of writing I was burning to do, and if I didn't do it then, I never would. I had written poetry in school, but creative writing was one of those things I always told myself I really wanted to do. Because I read a lot, it inspired me to want to do the same type of writing. Given that motivation, I took a short non-credit course at Penn where participants were required to turn in a critique and short story. This forced me to come up with a chapter that seemed like the possible first chapter of a novel. When it came time to get feedback, the group raved over my piece, and wanted to know where it was going from there. Inspired by the encouragement of my classmates, I got involved with the Rittenhouse Writer's Group in Philadelphia. In that group, I worked on the novel, getting each chapter critiqued. At this point I was falling in love with the actual process of writing. I was so energized I would get up at 4:30 in the morning and write until 7 A.M., when everyone else woke up. That became such a precious time to me -- I felt more alive and more engaged than I ever had before, which sustained me to keep writing. They were about 10. I would bargain with them for Saturday mornings, would let them stay up late Friday, and would make all kinds of deals with them, like be quiet in the morning and then I'll do something special in the afternoon with you. I'd get a lot of writing done on Saturday mornings, which was a big help. I meshed the roles of mother and writer by continuing to write early in the morning, a practice I still try to follow. When I get to the intensive stage, I just have to write all the time, which can be intrusive to my family. Sometimes when I'm in that phase, I have to leave the house and go to Pendle Hill, a nearby Quaker retreat and write there. If I don't get away and try to get through this phase at home it's too easy to put the writing aside and get caught up in the activities of my children. There are times when they will say "You were busy with your book" in a way that lets me know they needed me at that point. Sometimes they want my attention on them first, but that's natural. I'm sure motherhood has contributed to the expanse of my worldview, it's reflected in my books. I would be writing very different books if I weren't a mother. There is a certain emotional intensity that comes with motherhood, and that bond gets reflected in my work. My children were part of why I started writing -- I wanted to be able to give them everything I could. Intellectually, my children understand that I need to get work done and that this is my career, especially after I left my government job to write full-time. After my first novel came out, I did a series of extended leaves-without-pay, and tried going back for a few months, but wasn't able to go back in the same way as before. It was a wonderful job, but my focus was elsewhere. Although I had some trepidation about leaving, it was an act of faith. I took a deep breath and left, and I haven't regretted it, although I like the social aspect and being involved with people. One thing I really miss is coming home on Friday afternoons with that "TGIF" feeling. Now that my children are leaving I have no more excuses for not being productive and meeting deadlines. Initially, it will be very difficult, trying to prepare for it since so much of my energy and focus has gone to them. Oh yes, my books are like children because I can't take criticism about them. I read what people say about them, and if it's bad I just flip right on by. My daughter was first person to read Tumbling, and her reaction was what led me to send it to an agent. I'd go into her room when she was going over it, pretending I was looking for something but really seeking her response. She was so enthusiastic it gave me the confidence to send the book to an agent. One time I was scheduled to go to their school to talk about the book, but a reading at Borders was scheduled for the same time, so my children's classmates circulated a petition to get the meeting changed, and they packed the reading at Borders. So I think my children and their friends like my writing career. Neither of my children has ever seen themselves in my characters. They were so thrilled when the first book came out they would have probably liked to be written about. Even now they listen to early pages and give their opinion. Has there been anything from your children's lives that you wanted to write about but didn't for privacy reasons? Not from my children's lives, but when I get going, the events in the stories get scrambled up. I don't use specific things but draw on a sense of someone I know, and I do write about real things. For example, foster children lived around the corner from us when we were younger, and I remembers seeing their eyes, an impression I carried with me and drew on when I wrote. So although I've never been a foster parent, that powerful memory stayed with me and helped me to write about it years later in my fiction. My stories come from so many places. I didn't know much about heroin addiction, but I did know people who had been addicted. Watching them affected me in a way that led to writing about a character with that problem. My father was a state senator for two terms, so his world was politics. Writing fiction seemed like frivolity to him. Then I got a grant from the PA Council on the Arts to finish Tumbling, and he just couldn't believe that I would leave my job to write. He gave me a lot of input on what Philadelphia was like in the '30s and '40s, the setting for the book, but he never got to read it because he died before it was published. My mother always told me I was a good writer, but she looked on writing as a means to an end, never a fulltime job. I have 5 sisters and one brother, and we're very close. Several of my sisters are also good writers: one has a public relations firm, and one works for the government in Washington. They are my readers and give me feedback. I think one of my sisters will try to write now that she has a small son and is at home more. My husband and sisters are a real support to me. When I went on the road tour, even my children's classmates would help out! It was like their parents went through this whole process with me, volunteering to drive my kids places or whatever was needed. Emotionally, though, there is the part of me that never leaves, even when I'm on the road. I call home every morning to check on how things were going, partly out of habit. I'm working on my fourth novel, which is also set in Philadelphia. I'll be turning it in shortly, and am at that point of reviewing it with a critical eye. It's like when you're having people over, and the house you live in every day suddenly needs completely revamped. You see things you don't see every day, and that's what's happening right now. I'm seeing things about this book that I had been comfortable with before, and trying to clean it up as much as I can. You can read more about Diane at her website: http://www.mckinney-whetstone.com.